After enjoying our time with Carmen and her growing family, we spent a week playing with Dennis and Nancy (Larry's cousin) in Pomerane (near Tucson) and Howard and Maureen (Glorine's sister) in Phoenix. 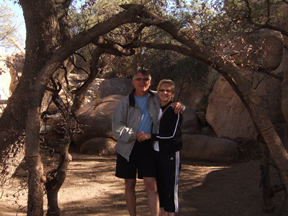 Walking, biking and hiking seemed to be the theme of our time in AZ. 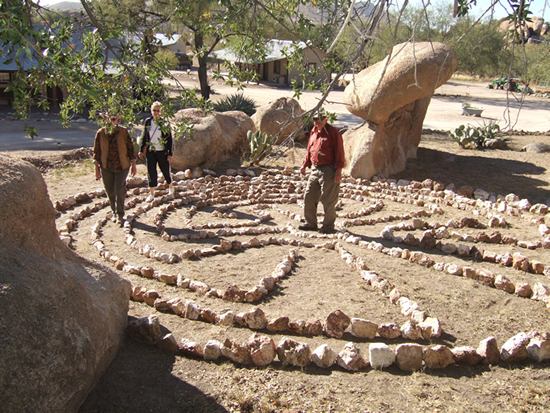 The above picture (with Dennis, Nancy and Glorine) is called a Labyrinth, a meditation rock garden used by many religions for the past 3,500 years--including Catholic basilicas in the fourth century. The only other time we ever saw such a thing was with Maureen and Howard last Christmas. There is a great spirit about Arizona. We enjoy hearing from you. 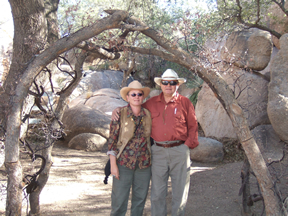 Click here to update us with your latest happenings.Larry and Glorine. 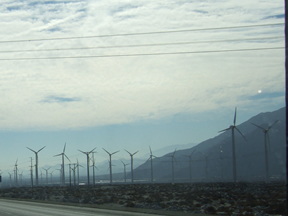 As we drove to Arizona, we were amazed by the "thousands" of wind generators that lined both sides of the Interstate between San Bernadino and Palm Desert. We can not recall one wind generator on our trip through the Midwest. As much as we complained about the winds in Montana, the Dakotas and Minnesota, one would think that they should be lining I-94. Boys and their toys. Yes, cousin Dennis has a new toy. It is a new off-road vehicle (called a Rhino) that is larger than an ATV and much smaller than a Jeep. It can go nearly anywhere, except climb walls. 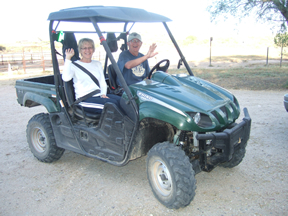 Dennis and Larry went on a couple of wild rides through the desert, along the San Pedros River, which is dry this time of year. They enjoyed every minute. These toys are not just for boys. Glorine took it for a spin in the neighborhood and had fun not having to avoid rocks and bumps on the road. It's like riding a horse with more control and a lot better suspension. Shiba (their dog) was enjoying the ride and is always ready for a ride when anyone comes near it. Southwest Arizona has a lot of history, but most of the history of small towns is now captured in small museums. 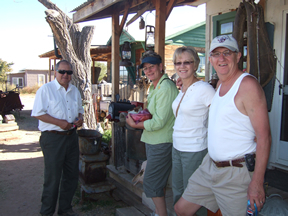 Cochise is one of those towns, with a current population of 39 people. We had a great time walking through the "past" and reminiscing about how it must have been like with all those old tools and equipment that our parents and grandparents used on the farms out in ND. This photo was taken at an old Japanese internment camp, where the US would detain top military brass captured during WWII. It is now known as the Triangle T Dude Ranch. We spent the previous evening dining and dancing at a restaurant that is a part of this complex. This is also where we walked the Labyrinth as noted above. The weather could not have been better. From Tucson we went to Phoenix to spend time with Maureen and Howard. We went hiking, biking, swimming and dancing. 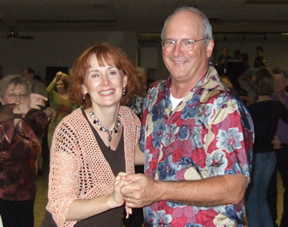 We learned the "West Coast Swing" at the local VFW and met new friends that we got together with the next evening. We were introduced to a plush gathering spot for Phoenix's "old wealth." Their happy hours were worth writing home about. Barbecued ribs, roast beef sandwiches were free (except for the tip) and drinks were half price. And what came free was a great ambiance and a view of the mountains. 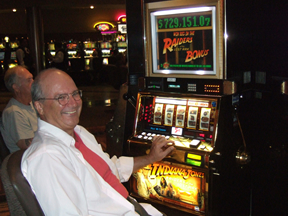 Indian gambling seems to be a growing trend everywhere, but especially in Arizona. So we hit the slot machines one night and Howard went away the big winner. Maureen, Glorine and Larry did not get hurt too bad, but had fun trying. 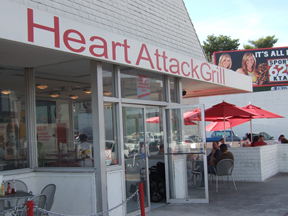 Another one of those unexpected sights was a restaurant called Heart Attack Grill. Their menu consists of one, two or three hamburgers on a bun with all the fixens, a large order of french fries cook in LARD, plus a Coke (no diet drinks), or beer. The burgers were named a single, double or triple bypass. The waitresses were dressed in nurses uniforms, very scantily dress. Glorine wants to keep this website at least a PG rating, so no pictures of the girls. 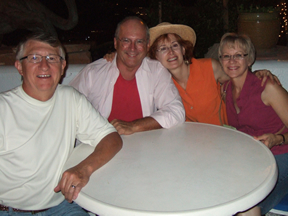 Arrived in Arizona on Tuesday, October 30 and left on Wednesday, November 7, 2007.